Editor’s Note: A previous version of this story erroneously listed the incorrect title for U.S. Rep. Ruben Gallego, D-Phoenix. Councilwoman Kate Gallego flew to Washington, D.C., last week to meet with the Federal Emergency Management Agency about flooding in her district. But she wasn’t allowed in the building because her identification, an Arizona driver’s license, was inadequate. Because FEMA requires IDs that comply with the REAL ID Act of 2005, an attempt by the federal government to standardize state IDs across the country following 9/11, Gallego could only get in when she had her passport delivered from home. With Arizona one of five states that aren’t in compliance with REAL ID, a state lawmaker wants to give Arizonans the ability to get driver’s licenses that meet the standards – if they pay for it. SB 1273, authored by Sen. Bob Worsley, R-Mesa, was headed to the House after the full Senate approved it Wednesday on a 20-10 vote. “There should be an option that those who travel a lot and those who need to get into federal buildings can go down to the MVD and get a REAL ID compliant driver’s license,” Worsley said in a phone interview. 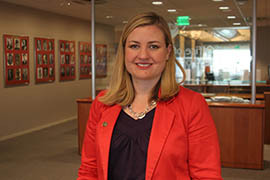 In 2008, Arizona lawmakers passed legislation authored by Sen. Judy Burges, R-Sun City West, that prohibited the state from issuing licenses that followed REAL ID. Worsley said that at the time most of Arizona misunderstood the measure. “The fear was that this could become a national ID card, that there would be a database sharing all of your driver’s license information with the federal government and that there would be federal interference with our privacy,” he said. Worsley said that hasn’t happened, but almost a decade later Arizona, Idaho, Maine, New Hampshire and Louisiana are the only states still holding out against REAL ID. According to the Department of Homeland Security, denying access to semi-restricted areas of federal facilities is the third phase of enforcement of the act. Since the first and second phases were implemented in 2014, visitors with licenses that weren’t REAL ID-compliant have been denied access to DHS headquarters, nuclear power plants and restricted areas of federal facilities. Gallego said this was the second time she has been denied access to a federal building since Phase Three took effect Jan. 19. The first time, she didn’t know about the rule, but on her last trip she just forgot to pack her passport. Starting in January 2016, she won’t be able to fly out of Phoenix without it unless Worsley’s bill becomes law. When the fourth phase of enforcement kicks in next year, an Arizona driver’s license will no longer be accepted by Transportation Security Administration agents at airport security. Arizona residents will need to bring a second form of identification, such as a passport, even when flying domestically. According to the U.S. Bureau of Consular Affairs, first-time applicants pay $135 and wait up to six weeks for a passport book. Under SB 1273, Worsley predicts that it will cost around $15 for Arizonans to switch to REAL ID, the same cost of getting a regular driver’s license. Gallego, however, said she thinks REAL ID is still a better financial decision for Arizonans who might find themselves forced to get a passport in 2016. Worsley said a lot of people who are concerned that the government will be able to track them through REAL ID don’t realize that there’s no radio frequency technology in it; passports, however, do have an RF chip. Worsley said he believes residents should be able to opt in to switching to REAL ID without forcing the entire state to. Those who do would be required to update their license photos every eight years. Other changes include modifications to how the cards are put together and the addition of an encrypted gold star that would identify them as REAL ID licenses. Arizona citizens may be required to purchase new IDs for travel because their state driver's licenses don't qualify as real IDs. 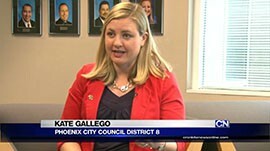 Phoenix City Councilwoman Kate Gallego says her Arizona driver’s license couldn’t get her into a federal building in Washington, D.C., because the state doesn’t comply with the REAL ID Act of 2005. A state lawmaker wants to allow Arizonans to get licenses that comply with the act – provided they pay for them.